It is the year 2039 (one hundred years since Batman was created, wink wink nudge nudge), and technology is so pervasive that nothing is unknown by the government...nothing except for this mysterious Batman who has sprung out of seemingly nothingness. Now, a federal agent is dead, and this Batman is wanted for the crime. 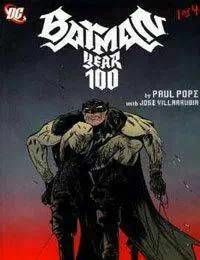 James Gordon (you-know-whos grandson) tries to maintain order in Gotham and find the REAL killer, while the feds are just obsessed with finding this Batman, and why he can exist off the screen.